The Centers for Medicare and Medicaid Systems (CMS) and private insurers have identified numerous pay-for-performance measures, confirmed in large part by evidence-based medicine, and implemented them in hospitals, clinics, and doctors’ offices. For example, there are process measures for hypertension and heart disease where, for example, periodic readings of patient’ blood pressure and blood sugar levels are reported. But testing does not tell you whether the patient is bringing these diseases under control. So intermediate outcome measures that focus on patients’ actual blood pressure and blood sugar levels are noted to indicate whether the patient is improving, stable, or deteriorating. As one would expect when attaching high stakes to metrics in a helping profession such as medicine where there are many stakeholders (e.g., insurers, employers, doctors, medical staff, patients) views on pay-for-performance measures diverge, especially since insurers have published “report cards” displaying rankings, percentages, and results of these different measures for organizations and individual doctors. Divergent views of performance measures and “report cards” are inevitable when one examines the complex terrain that physicians inhabit and the predicaments they inherently face: expertise is never enough, making decisions amid uncertainty is common, and dependence upon the patient for improvement is essential. No surprise, then, these metrics and their outcomes, thus far, have generated mixed reactions. See here, here, and here. Many policy makers, administrators, and doctors are satisfied that the measures are consistent with findings derived from evidence-based medicine and their experiences with patients. They welcome efforts to raise the quality of care and reduce costs. While many primary care doctors do agree with the policy initiative, they still question the measures because they know that these metrics—even when evidence-based medicine endorse the measures–seldom pick up individual differences among patients who have breast cancer, heart disease, or diabetes. Consider a pediatrician whose practice includes adolescent girls. He tells the story of what happened to him when one of his insurer’s measures of quality care is a requirement to test all sexually active girls for chlamydia, a sexually transmitted disease. Since insurers do not and cannot read every single medical chart, they use a proxy measure to determine whether a girl is sexually active. They check to see if patients take birth control pills. That proxy complicates matters greatly because the pediatrician’s patients don’t take those pills for contraception, but for acne and menstrual pain. For another primary care physician who has been highly ranked in the past on these measures from the local health insurer, her current “report card” left her dismayed. These recent policy efforts to create accountability through establishing performance measures and dispensing monetary rewards to those who reach the benchmarks end up steering clinical practice toward standardization. These physicians I described are caught in multiple predicaments. 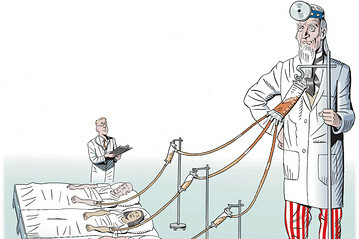 They are involved, unknowingly, in the struggle that has gone back and forth in medical circles for decades over the worth of doctors’ intuitive judgments vs. empirical evidence when uncertainty reigns and the abiding quandary of being dependent upon patients for success when the metrics make the doctor wholly responsible for outcomes. And now there is a full-court press that policymakers, saturated with data, have mobilized to standardize medical decision-making to increase efficiency and effectiveness. As James Scott argued in “Seeing Like a State” (Yale University Press, 1999), large organizations of all kind value the manageability that comes from uniformity over actual performance. Excellent article. This rings true on SO many levels. I appreciate your ability to link these two worlds so clearly and share such a wonderful insight. I used it for my twitter #ReadAndRespond for May 2. Thanks for sharing some great thinking. Thanks, Michael, for taking the time to comment. This article in NYT covers use statistics and data gathering to measure the performance of city departments. One recommendation was to use metrics for accountability not blame. Asking the question ‘what do you need to fix this issue?” versus “why are you failing?”. Sounds like the doctor performance metrics are doing the latter not the former. Ian, I had not seen piece and enjoyed reading it. Thanks. The questions you ask apply to teachers and teaching and how accountability through evaluation and pay for performance are currently rendered in districts.